Upcoming and past cat shows. 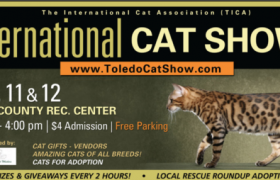 This year KotyKatz Bengals will be showing two Bengals at the Toledo Cat Show – Presented by Great Lakes Cat Consortium and Glass CiTICAts Cat Club. The event will take place on Saturday February 9 and Sunday February 10 at the Lucas County Rec Center from 9am – 4pm. For more information about the event, exhibitors, and vendors, click here. The Bengals shown will be KotyKatz MeeChee, and Pouncing Paws Abbymya of KotyKatz. On Safari 2017 Now that On Safari 2017 is over, we’d like to share a few of our photos with you! 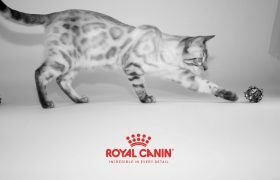 This year KotyKatz Bengals will be showing our very own KotyKatz Finnegan at the On Safari Cat Show – Presented by the International Cat Association’s CITICAts Cat Club. The event will take place on Friday February 17, Saturday February 18, and Sunday February 19 at the Roberts Center in Wilmington, Ohio. For more information about the event, exhiitors, and vendors, click here.